ADHESIVES – Gaska Tape Inc.
Gaska Tape Inc.® products are often coated with “acrylic pressure sensitive adhesives (acrylic PSAs)”. They offer performance advantages over other types of compositions. Acrylic PSAs exhibit good ultraviolet and exterior durability, excellent chemical resistance under a broad range of temperatures. These adhesives are typically characterized by peel and shear. PEEL: Is a measure of an adhesive’s ability to wet out a surface and subsequently adhere to the substrate. 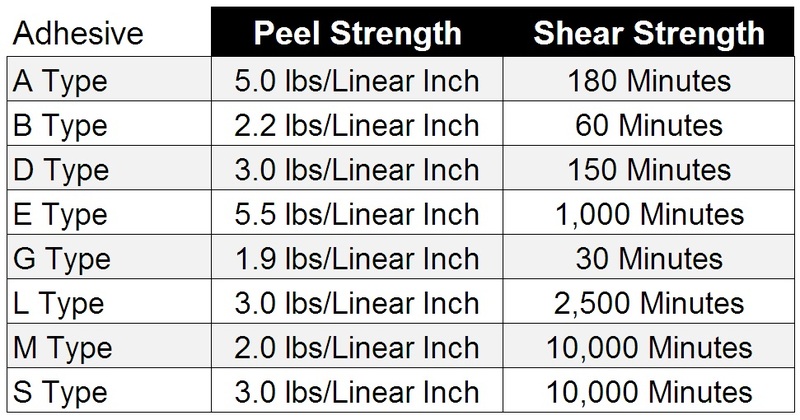 The most common way peels are measured is by 90 degree or 180 degree data on a particular substrate after a certain dwell time. Gaska Tape Inc. normally reports 180 degree peel data per ASTM D-1000 or PSTC-101 in pounds per linear inch. SHEAR: Is a measure of an adhesive’s vertical holding power. It is generally measured by attaching a specific surface area of adhesive to a substrate, attaching a known weight to the adhesive and carrier, then measuring the amount of time the adhesive would hold the weight. Gaska Tape Inc. generally references PSTC-107 and reports minutes or hours an adhesive would hold a 1000 gram weight to a 1 inch square of foam or film to stainless steel or glass and stainless steel. Emulsion acrylics consist of acrylic emulsion polymers modified with tackifiers, surfactants, wetting agents, rheology control, foam and air release and other ingredients that enhance performance and coat-ability. Offer relative safety in handling, processing and waste disposal. Less costly in equipment demands and raw material requirements. Requires significantly more energy to process relative to other types like solvent based and hot melts. Offer some formulating latitude for performance properties. Solvent-based acrylics are acrylic polymer solutions in organic solvent blends. These solutions contain chemical cross linkers which polymerize or crosslink the polymers as the solvent volatizes. Other additives may include tackifiers, coating enhancements and secondary cross linkers. Relatively expensive, adhesive costs are 30% to 70% more than emulsion adhesives. Handling and equipment demands explosion-proof electrical motors, wiring, static control, exhausting and treatment of volatiles, including waste disposal. Generally process faster than water-based adhesives, solvent types may require less dry film weight to achieve performance characteristics. Offer a wide range of formulating latitude to achieve performance characteristics. A TYPE: Is a lower cost, general-purpose aggressive, soft, high peel, low shear acrylic pressure sensitive adhesive. This adhesive exhibits adhesion to a wide variety of surfaces. A Type adheres well to stainless steel, aluminum, glass, cold rolled steel, painted metal and some plastics (e.g. acrylic, ABS, etc.). A Type adhesive is approved for many automotive grade applications and general industrial uses. B TYPE: Is a specialty, higher cost, medium peel, low shear modified acrylic pressure sensitive adhesive able to bond to some of the most difficult to adhere to rubber and rubber like products. D TYPE: Is a low cost, medium to high peel, low shear tackified acrylic pressure sensitive adhesive designed to adhere vinyl foams to a variety of materials where no to low stress is involved. E TYPE: Is a low cost, high peel, moderate shear tackified acrylic pressure sensitive adhesive designed to adhere to low energy foams such as polyethylene, polypropylene and polystyrene. G TYPE: Is a specialty low cost, low to medium peel, low shear acrylic pressure sensitive adhesive. This adhesive exhibits good adhesion to oily metals (common with galvanized metals). It can be used in applications where performance at lower temperatures (to -40°F) is desired. L TYPE: Is a high cost, high peel, and moderate shear tackified acrylic pressure sensitive adhesive modified to adhere to low surface energy surfaces like polyethylene, polypropylene, ABS and other composite plastics. S TYPE: Is a high cost, moderate peel, and high shear acrylic pressure sensitive adhesive. This adhesive exhibits resistance to chemical migration and has good aging properties on vinyl. Possible applications include window glazing, spacers for silicone sealant curtain wall construction and temperature requirements up to 250°F. Test data was derived from coating the above adhesives on a 1 mil polyester film at a target coat weight of 2.6 dry mils. Peel data was determined on stainless steel after 20 minute dwell per ASTM D-1000. Shear data was determined using 1000 grams per square inch according to PSTC 107.